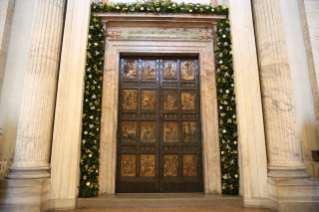 Saturday, April 11, 2015 at 5.30 p.m. before the Holy Door of the Vatican Basilica, on the occasion of the First Vespers of the Divine Mercy Sunday, the Holy Father Francis published the Bull Misericordiae Vultus for the Indiction of the Jubilee of Mercy. 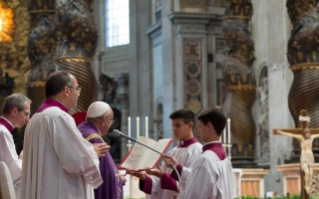 The Pope consigned the Bull to the Cardinals Archpriests of the papal basilicas in Rome, to a few representatives of the Church spread over the World and to the Protonotaries apostolic. Then, some passages of the Bull were read before the Holy Door of St. Peter's Basilica.